Without sales, you don't have business. But if you're spending time meeting prospective clients and servicing existing customers, it's hard to find new leads. A VA can find and research individuals, companies, and technologies, via blogs, websites and forums. They can prepare reports and briefs to help you determine who to contact next. With the right information in hand you can focus on developing new business relationships instead of having to spend time researching. Today’s world is driven by data. While managing colossal amount of data is a challenge in itself, the form in which the data is available poses an even bigger challenge. Data are just some basic information within any given company and the business growth is highly influenced by how the pertinent data are primarily collected, saved, transformed, analyzed, and interpreted. Data Integration has become an essential means to leverage the power of some raw data. Velan Info Services delivers Data Integration Services for all kinds of industries and organizations to leverage the sophistication of advanced data integration and analytics. With a dedicated team of survey experts and web researchers, we gather both qualitative and quantitative data through extensive web research and surveys. We guarantee accuracy of the data and delivery within the proposed deadline. We present data in the most intelligible form facilitating our clients to search and find relevant information. We collect data from various sources to get a grip of customer preferences, market status, and competitors. We also provide customized data by looking into specific websites and surveys. We conduct extensive searches to get hold of data that are hard to find. Companies may possess data such as contact details and the like which are of paramount importance. But if the data are outdated or inaccurate, they may not mean so much for the company and ergo become futile resource. Data cleansing comes in handy if you are in possession of a massive database which calls for enrichment. Velan provides data cleansing services for such companies to enhance their productivity and give them a competitive edge. We optimize your database and make it a potential resource to help your business grow. We provide Data Standardization services to transform your data into a standard and comprehendible form. Possessing massive and accurate data will not just be enough unless you have it standardized. Standardization allows you to search and retrieve information that you require by adding filters wherever necessary. This will save you a lot of time and money, and increase efficiency multifold. Not only confusions accompany large amount of data but also they highly affect the efficiency. Velan provides data matching and deduplication services to help eradicate data duplication thereby increase the accuracy. We map the records and fields to identify and delete redundant & irrelevant data to provide our clients with a clean database. Data linkage is the basic of data integration. It basically provides links between different sources of information that possess some common data. Velan provides data linkage services to allow you to look for data from different sources without any hassles. Trend Analysis is important for a company to have the competitive edge. Trend analysis gives you an insight into the market to help you make profitable sales, marketing, and investment strategies in future. Trend analytics will also let you have the competitive advantage that any business requires. 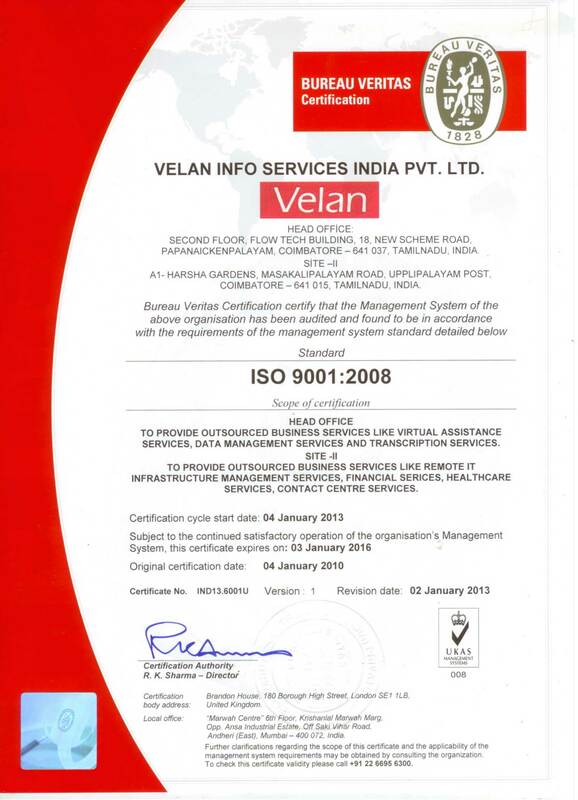 Velan also helps it clients by providing Data Scraping services. We deliver processed output data in the designated output formats. Before the data is delivered, it undergoes verification and validation to ensure that customers get accurate data of the highest quality at all times.